Welcome to Lucky Chocolates! 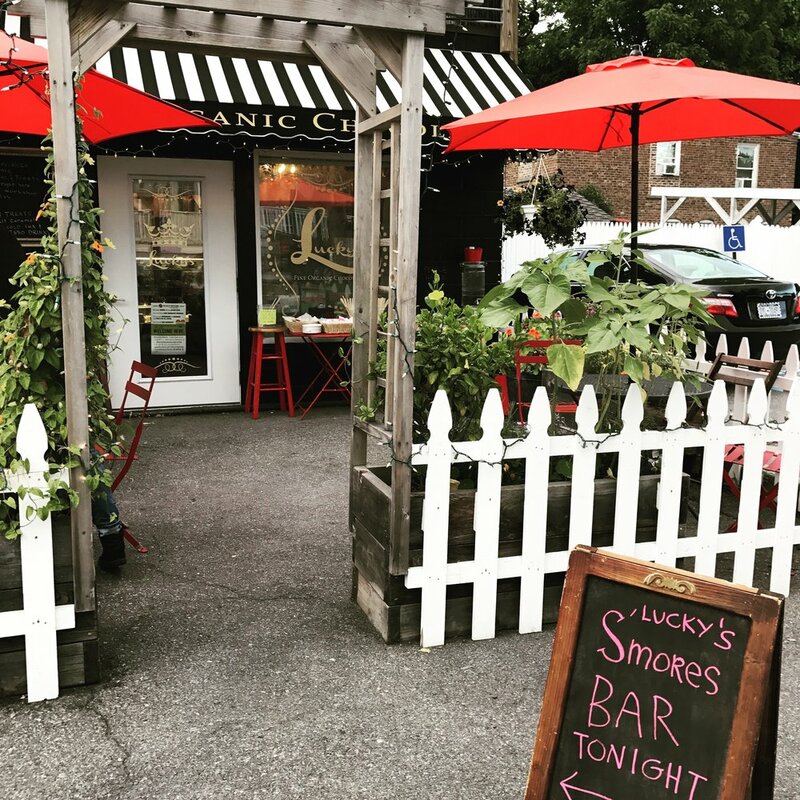 A small town Chocolate Shop with Organic Handmade Chocolates situated in the Village of Saugerties, New York. Join us in celebrating the wonders of chocolate! We are a dark chocolate specialty shop, who try our best to remain as organic and fair-trade supporting as possible. As a small operation, nearly all of our chocolate is made in house by a tiny team of three. From our easy and delicious marshmallows to decadent dessert worthy truffles, we have it all! Buy your loved ones a special gift, or treat yourself to something that will make you a chocolate lover for life! If you're looking to add a little Lucky Chocolates to your Business why not try some of our best Sellers? Handmade Salt Caramel Marshmallows are one of our best sellers! We make the marshmallow in house, swirl it together with our delicious caramel, coat it in our decedant 70% Organic Dark Chocolate, and top it all off with Sea Salt! We've got it all, Nut Barks, Fruit Barks, Spicy Barks, Sweet Barks. You name it! And if we don't make it already, we could make a custom bark just for you! Just choose from our Wonderful White Chocolate, Mouthwatering Milk Chocolate, or Delectable Dark Chocolate and tell us what you want to fill it with! Nothing is more rich in flavor or looks than our Truffles! Our very unique Sour Lemon, our classic Dark Cocoa, our new Vegan Raspberry! They're all amazing, and the perfect little sweets for any business. Want your logo on our truffles? We can do that too! Ask us about getting custom transfers done for your chocolates! Need a quote? Curious to see what we sell wholesale? Want a custom product made? Shoot us an email! Thank you for your inquiry! We'll get back to you as soon as possible! We use the finest chocolate, Agastoni brand. Organic and fair trade, that feels as good as it tastes! Our Cocoa that we sell by the bag, use in our Mochas, and dust our Cocoa Almonds with is Dutch Cocoa from Agastoni. Our Organic Cocoa Chips are from Multiple Organics. The caramel and dairy we use may not be vegan but it is certainly delicious! Soft, sweet Peter's Caramel and fresh milk and cream we pick up locally from Adams Fairacre Farms in Kingston. A good portion of our nuts come from organic sellers like Tierra Farms! All come to us roasted and salted. Delicious and perfect to mix with our chocolate! Some of the nuts we use for toppings will come from our local Mother's Earth Storehouse! Our Organic Cane Sugar is used to sweeten our delicious marshmallows! Flaky Maldon Sea Salt is used to top our famous Salt Caramels and Salt Caramel Marshmallows, huge delicious chunks that really bring out the flavor of our chocolate! The organic dried and candied fruits we dip and smother in our 70% dark chocolate all come from Nuts.com! All of our products are made with as much care as possible, however we are a small business that handles both nuts and gluten, and cross-contamination is likely. We warn against taking risks if you have a severe nut or gluten allergy. Please take this into consideration when buying for people who have these allergies. We are sorry for the inconvenience and hope to remedy this in the future. We ship anywhere within the U.S. using the United States Postal System! We take extra care in packaging all of our chocolates so that they arrive to your or your loved ones safely! We do not currently ship internationally, but we are looking into expanding our shipping radius in the future! When can I expect my package to arrive at its destination? Will it arrive in time for (Holiday/Event)? Most packages will arrive within 3 days of being mailed. However, it can take us anywhere from 1 to 5 business days depending on time of the year and availability. We suggest you make all holiday orders early and leave instruction to send at a later date to insure you get exactly what you wanted. When do I know I can pick up my order after choosing the Pickup In-Store option? We will send you a conformation email once your order is done. After that it can be picked up during our regular business hours at your earliest convenience. How long will your chocolate keep for? Our fresh truffles will keep for a solid 3-4 weeks if they are properly stored. Our solid dark chocolate and vegan options are capable of at least twice as long as there are no dairy or nut products in them! Should I put it in the fridge/freezer? You can, just make sure to wrap it up tight! Condensation and moisture are bad for chocolate. The best thing to do is to keep it out of the sun and in a cool dry place. I put it in the fridge and the chocolate looks weird? Moisture likely got to the chocolate and threw it out of temper. It's still edible, just ugly. Vegan means that there were no animal or animal-by-products used in the making of something. If you're wary of the word, do not fret! It's very likely the lettuce you used in your salad the other day was also vegan. Yes! We have tons, as chocolate in it's original state is naturally vegan. Many of our dark chocolate treats will have vegan options to them, if they weren't vegan already! No, sadly it is not. We are, however, on the hunt for alternative vegan caramels we can use in the future! Questions? Reviews? Requests? Send us a message!